Mkhululi Sijora was born on the 1st August 1982 in Cape Town, Western Cape. He was the only child from his mother. Popularly known as ‘Khusta’ a name he got from his peers in the streets of Makhaza where he grew up and did most of his activism work. During his high school years in Chris Hani High School he became a peer educator and through that he did a lot of community work and at the same time he was writing and performing music as a rapper in a group he formed with friends, the groups’ name was Triple G’s. After acquiring his matric he enrolled at Cape Peninsula University of Technology (CPUT) for tertiary education studying Retail Marketing, this is where he was introduced to the world of politics. Khusta noted that before going to CPUT, he was not very interested in politics. After he was done with his studies he continued with making music performing at local hip hop sessions with his crew the Triple G’s and he continued working closely with Love Life: Ground Breakers. Khusta was drawn in into SOS since 2010 first as a regular to the Struggle, hiphop and poetry in Lookout Hill, Khayelitsha. Quickly he became one of the key members, he was then to join the inner circle meetings, and this is where his global politics were challenged, along with his perception of how much influence music has in changing the fabric of society. Cde Khusta gave all his time and life to defend the working class and all oppressed people. He was particularly critical of all bosses and political parties; he argued that the people themselves have the will and the power to rule themselves. Within a space of a year he showed so much potential and became reliable comrade to take mandates from the organisation into other movements that we were interacting and building with. 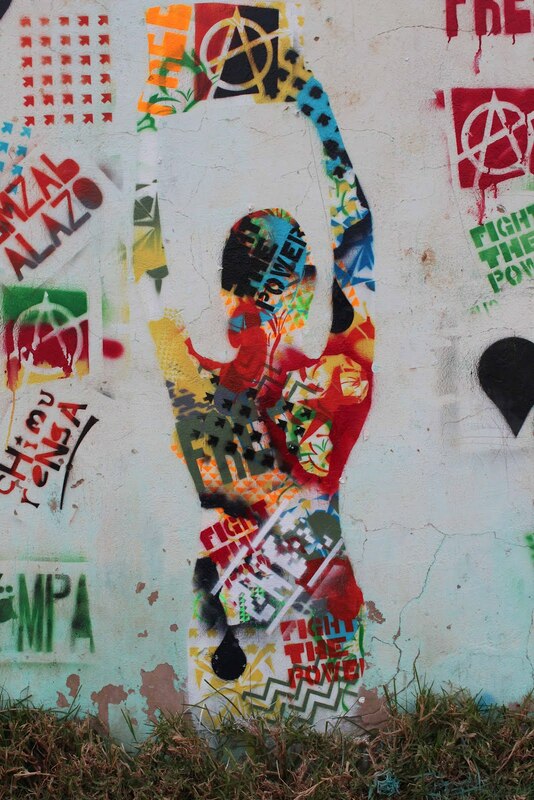 Kusta didn’t separate his activism with his artistry. He was amongst the few artists that responded to the brutal murder of the Andries Tatane. He didn’t hesitate to defend and demand justice for the Marikana mineworkers. Who gave them the right to take the people’s lives? He also put all his weight behind the #FeesMustFall. The comrade will be missed for his energy in protests as he was known for leading the struggle songs. He will be missed for his abilities in resolving conflicts with the movement, for he perpetually focused in building the unity of all people in struggle. 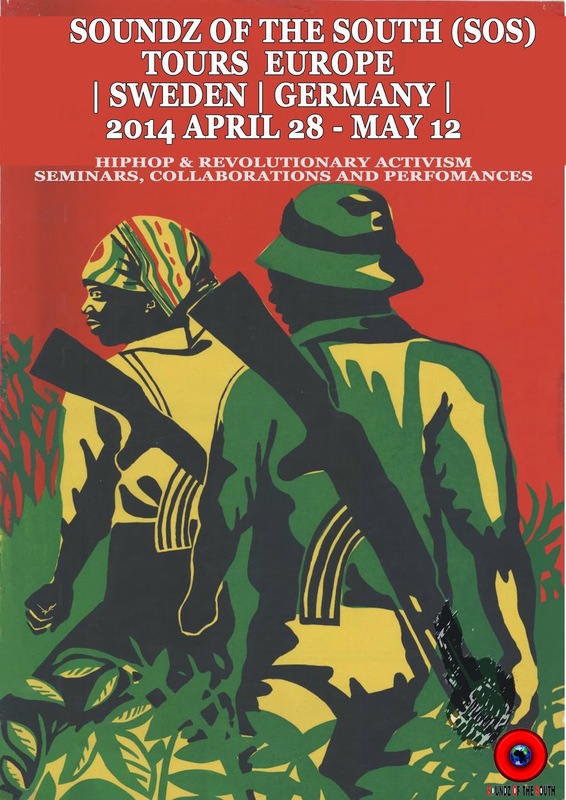 Biko Mutsaurwa, 2013, “The Afrikan Hiphop Caravan: Building a Revolutionary Counterculture,” The Journal of Hip Hop Studies, volume 1, number 2, pp. 226-231.
coherent Afrikan Hiphop Movement based upon a strategic orientation towards social movements of the working class and the oppressed. Soundz of the South: Don’t Vote! Organise! 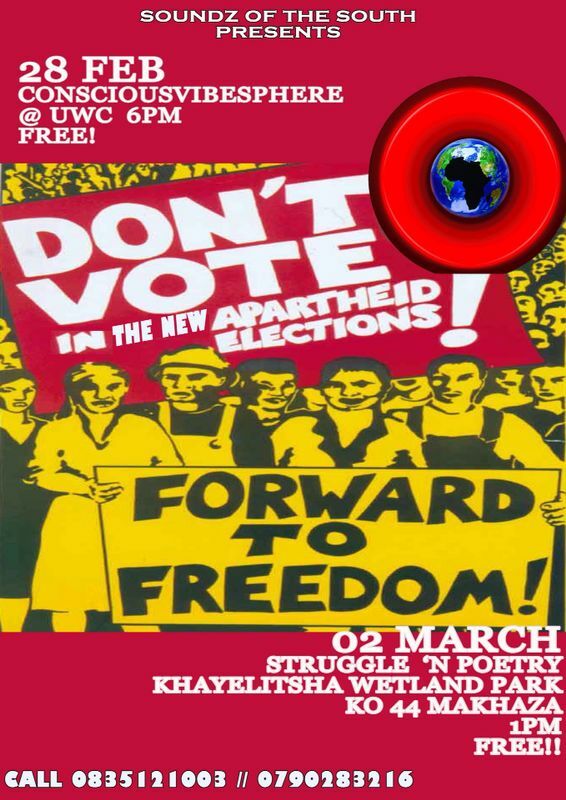 In the build up to the 2014 elections, politicians – whether from the DA, ANC, EFF, or PAC – have been calling on us to vote. As part of this, they have promised to meet people’s needs, end poverty and serve communities when they are elected. The promises of all these politicians are lies.